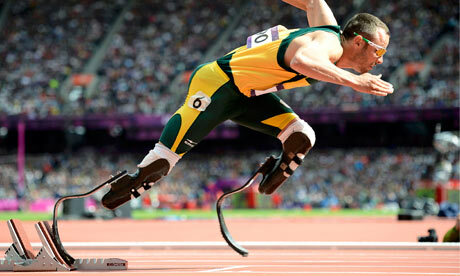 26 years old Pistorius Oscar, is a double-amputee and a South African Olympian. He is the first Paralympian to compete in the able-bodied Olympics. He runs with the aid of prosthetic limbs. He is commonly called "Blade Runner". In the final athletics event of the 2012 Games, he smashed a Paralympic record to win the men's 400m T44 . His girlfriend, Reeva Stenkanmp was found dead in his upscale Pretoria home early this morning. Its is speculated that she was mistaken to be an intruder and so was shot on the head and the arm. She died immediately. Reeva Stenkanmp has a law degree and she is also a top model who worked for various agencies like Avon, a cosmetic company and Toyota. She has also worked as a presenter for FashionTV in South Africa. It has not been disclosed if exactly if he is the one who shot her, but Police charged a 26 years old man as the same age as the Olympian with murder in connection with the shooting. The suspect would be appearing in Pretoria magistrate court later today. "We can confirm he was taken to a police station but can't confirm if he is the suspect," said police spokeswoman Denise Beukes. "You will find out in the afternoon." Reeva Steenkanmp who is 29 years old was looking forward to Valentine Day and she tweeted this on her page yesterday "What doyou have up your sleeve for your love tomorrow?" to thousands of her followers. ( LINK- thousands of followers on Twitter). Police said Pistorius is cooperating with them and he is sad at the moment.